Mobilink Indigo has launched a postpaid plan to cater small and medium enterprises (SMEs), with discount on monthly usage. 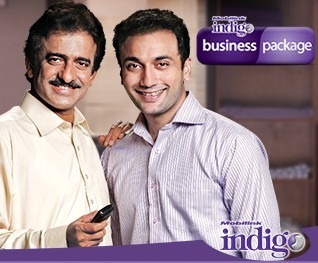 ‘Indigo Business Package’ offers 30 paisas per min rate on group calls between business team members. If you are company, comprising of 4 to 25 employees, then you can opt for iBusiness package, which is bundled with GPRS buckets and discounted DSL/WiMAX connection. 5% Discount on bills of Rs.1000 or greater. Discount is available on bills of up to Rs.20,000. DSL services are offered in Lahore, Karachi, Rawalpindi, Islamabad, Faisalabad, Sialkot, Peshawar, Multan, Gujranwala, Hyderabad, Mardan, Rahim Yar Khan, Sahiwal, Wah, Gujrat, Jhelum, Sargodha, Sheikhupura, Abbotabad, Quetta, Dera Ghazi Khan, Ghazi Kot, Bahawalpur, Sukkur, Nawabshah & Larkana. The iBusiness package is available for customers acquiring 4 to 25 lines. Security deposit is Rs.1000 per line. Default access to customer subscribing this package is NWD only. Additional security deposit will be required for IDD and IR access. Standard Government taxes apply i.e. Sales + Income Tax. Bill discount will be offered on amount before taxes. Group Call Rate is for active subscribers of the Business package within the same company calling each other. Group Call Rate is not available for MNP/Port-In numbers. Mobilink reserves the right to switch subscribers to i-100 package, in the event of total number of active accounts under company falling below the minimum requirement of 4 at any stage. Great work Mobilink ….. you should use your own brainpower rather than copying Telenor karobar package …..
Hahah. I agree with Imran’s comments. not a bad offer and what is copycat thing here?? voice + SMS + GPRS is what every operator offers and not the patent offer of another operator. and look they have included DSL as well so am sure they gonna give tough time to others. ML has really gone aggressive this time. yes waqas ur rite telenor is rebranding its karobar package & persona package…. relating the add and rates to Telenor is very naive point of view. get it to experience the real deal. Nice package. I like the tvc too. All this fuss over copy? Isn’t this website a copy of many other websites? Isn’t each bank always trying to compete with each other by offering similar products? No one seems to look at value. As a home-run consultancy, I was unable to get Karobar because of documentary constraints. But no such problems with Mobilink’s offer. Low Group call rate, Discount on Bills, and the internet and DSL bundles. Complete value from a really good copy. Follower advantage! Indigo is very cheap calling rate provided and voice + SMS + GPRS is what every operator offers and not the patent offer of another operator. and look they have included DSL. Discount is only applicable till 20k. If Bill goes above 20k then discount will remain at 1K. CUG rates don’t apply on MNP numbers. Lower effective CUG rate then 30 paisa through teamtalk, teamtalk also gives free mins for partner companies.